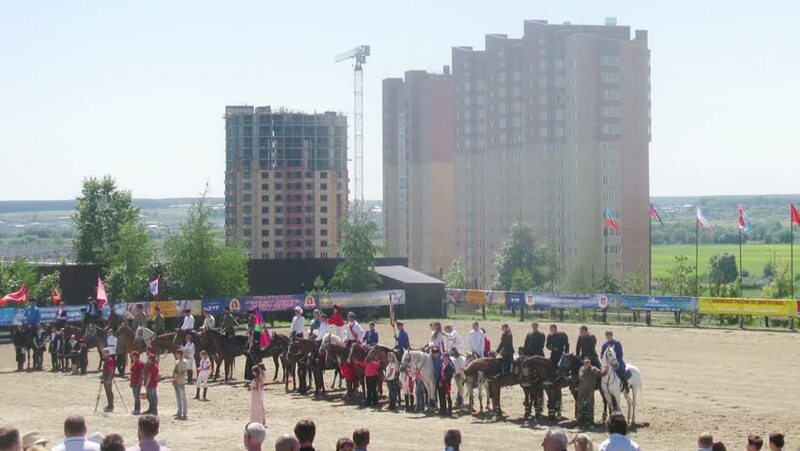 LYTKARINO - JULY 13, 2014 (Time lapse): Spectators watch as the horsemen on horses lined up, then they leave, at competitions on dgigitovka , July 13, 2014, Lytkarino, Russia. hd00:25MOROCCO - CIRCA MARCH 2011: A horse-drawn carriage crosses a large plaza circa March 2011 in Morocco. 4k00:10Madrid / Spain - 03 17 2019: People are dancing a traditional Chinese or Asian dance outdoors in Madrid Rio park downtown Madrid on a weekend warm spring day. Asian style exercising outdoors.